Galbraith has proudly been providing commercial design/build services to clients in the Hagerstown, Maryland area for several years. Hagerstown is the county seat of Washington County and the largest city in the Western Maryland region. 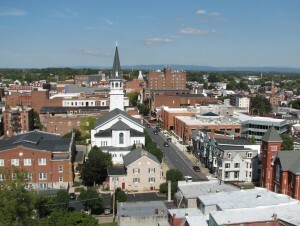 Despite its semi-rural Western Maryland setting, Hagerstown is a center of transit and commerce. Sitting at the crossroads of two major interstates, I-70 and I-81, it serves as a gateway to the Baltimore and the Washington, D.C. area as well as the “hub” of government, commerce, and recreation for the tri-state area. The Hub city is the fastest-growing metropolitan area in the state of Maryland and one of the fastest growing in the United States. The city’s distinct topography is formed by stone ridges running from northeast to southwest through the center of town. The Stonehenge limestone in these ridges was used to build many of the older buildings in the city, like the St. John’s Episcopal Church and the Presbyterian Church. In addition, you’ll find over a dozen scenic and picturesque parks throughout Hagerstown, such as the City Park, which has been hailed as the “second most beautiful natural municipal park.” Between its lake, wooded walking trails, picnic facilities and recreational amenities, this is the crown jewel of the City’s park system. Just across the City Park Lake, is the Washington County Museum of Fine Arts, which showcases a variety of exhibitions, concerts, lectures, and films. At Galbraith, we pride ourselves on our customer service. Too often, commercial contractors or designers will take a cookie-cutter approach to their projects and use cheap materials or outsource work to unqualified subcontractors. We believe that every project should be tailored to the owner’s goals and specifications without cutting corners. Our wide breadth of project experience and specialty expertise lets us assist our clients in the Hagerstown area with land acquisition and site development, planning and design, tax abatement and financing and adhering to regulatory guidelines and local stipulations, all while finishing our projects on time and on budget. Our team of experts focuses on preventative problem solving and proactively managing projects so we minimize potential issues, project change orders, and unforeseen costs. Contact us for your initial consultation, and let’s get to work on your project in Hagerstown. We will schedule a time to meet with you, discuss your ideas, and then design and build you the perfect building for your specific business needs. You always receive a job that is completed to your full satisfaction, in a timely manner, and within your established budget.